On April 1, 1972, West Ham United made sports history by becoming the first club from the highest echelon of English football to field three black players in League competition. 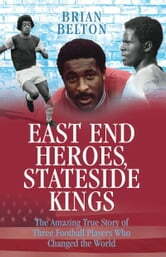 Clive Charles was born in Canning Town, just a few miles from the Hammers' Upton Park home; Ade Coker came to London from Nigeria; and Clyde Best had made his way to London's Docklands from Bermuda. All went on to great success in the United States. After being named by Pelé in the all-time greatest NASL team, Charles managed the leading College side Portland Timbers, guided the American Women to World Cup glory, and achieved historic results in Olympic competition with the U.S. Under-23s. Best grew to be a legend in the NASL, and along with Charles, was one of only four former West Ham players to manage at international level when he took over the Bermudan national side. Coker was another leading light in the modern game and represented the U.S. at international level, overcoming devastating injury. Painstakingly researched, with a foreword and interview with entertainer Kenny Lynch on the nature of support in the 1970s from a black perspective, this book tells the story of three young black men who changed sports history.